A retinal vessel occlusion is a blockage in the blood vessels of your eye, that can cause sight loss. The main cause of retinal artery occlusion is atherosclerosis, this is a narrowing, or sometimes hardening or thinning of the arteries at the back of your eye. This can cause problems with blood flow, causing a blockage to occur. 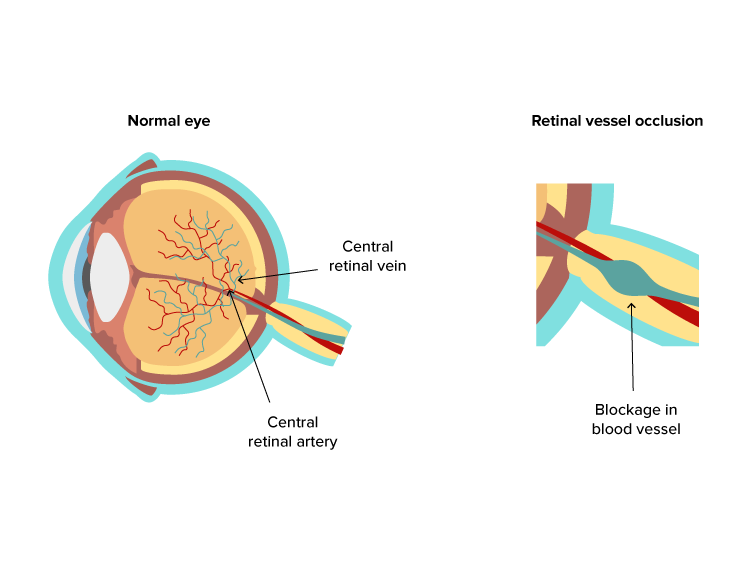 In turn a blockage can cause a retinal vein occlusion, which could also lead to sight loss. Having high blood pressure, high cholesterol levels, being diabetic, smoking and being overweight can all increase the risk of atherosclerosis, and therefore increases the risk of having a retinal vein occlusion. These factors can also increase your risk of stroke, which for some people, can also cause problems with vision. How can I reduce my chance of getting a retinal vessel occlusion? Having a healthy diet, low in saturated fat, losing weight and taking regular exercise, as well as stopping smoking and reducing the amount of alcohol you drink. These can all help prevent or reverse the process of atherosclerosis, reducing your risk of retinal vessel occlusion and stroke.